Turmeric is used as a food colouring and flavouring, a fabric dye and a wonderful spice that’s said to reduce inflammation and is used to treat certain cancers. It’s a tropical and subtropical summer rain lover. That means you’ll need to keep it moist over summer. It will die off pretty quickly if you get really chilly or frosty nights in autumn too. Growing turmeric is pretty easy really. Step 1 I grow it most successfully in full sun to bright shade in a loose soil. The loose soil means better root development and easier to harvest. Dig in some old animal manure before planting time to prepare the soil. Step 2 Plant the rhizome on its side about 2 finger joints deep into the soil. (So about 3-5 cm.) Each rhizome needs a little bud that will spring to life and grow a leaf shoot. The rhizome can be cut or snapped into smaller pieces if you have a large one. Step 3 After planting, wait til the shoot grows, keeping the soil around it moist all the time, but not too boggy. Once the shoot has grown through, mulch the area with cane mulch. I give mine an occasional liquid feed with Backyard Box organic fertilisers(available from me) and animal manures. 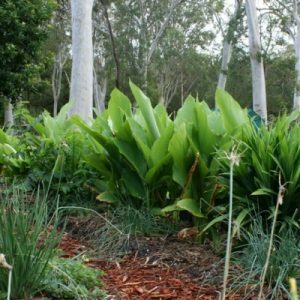 You will also be rewarded with pretty creamy white ginger flowers. 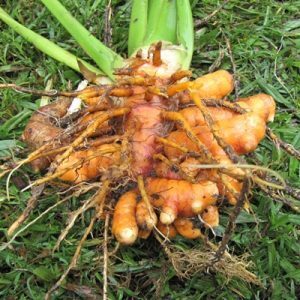 The feeding will create plants that are luxuriously happy and green with up to 3 kilos of tumeric root per plant. 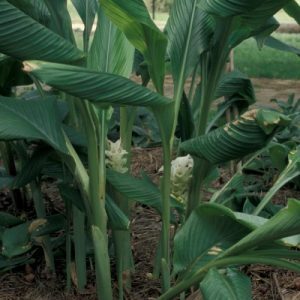 Like ginger, the turmeric plant dies down at the end of summer. When the leaves are brown, water the area well and gently lift the roots with a fork. If you leave some in the ground they’ll grow into your plant for next year. Remember to fertilize the area well with manure again. Using it…I clean, finely slice and dry some of my harvest, freeze other pieces and use much of it fresh. We love green smoothies with turmeric; curries; coloured rice and I even make paints for the children’s workshops with it too.